The suspension of Nemanja Matic on February 21 finally gave 20-year old Lyon-born Kurt Happy Zouma a chance to prove his mettle. Although he was signed in by the Blues as early as January 2014 for a reported sum of £12 million, fans didn't get to see much of him as he was under obligation to fulfill his contract with his former club, St. Etienne till the end of the 2013-14 Ligue 1 season in May 2014. The young French put in a powerful performance in his role as a center-back in Chelsea's 2-0 win over Tottenham Hotspur in the Capital One Cup Final. Zouma put his physical strength and technical abilities to good use fulfilling his new role of a central defender entrusted to him by Jose Mourinho. In the match against Tottenham he won five aerial duels, made four interceptions and one tackle. Although he is quite some distance away from reaching the levels of excellence of club mate and midfielder Matic, he will probably be shaped into a centre-back slated to take over responsibilities from John Terry. Zouma's first competitive appearance for the Blues was in a League Cup encounter with Bolton Wanderers which his club won 2-1. His first Champions League appearance for Chelsea came against Slovenian club, Maribor where he put his defensive abilities to good use by keeping a clean sheet in a thumping 6-0 win for the Blues. A October 2014 clash with Manchester United at the Old Trafford saw him making his English Premier League debut. 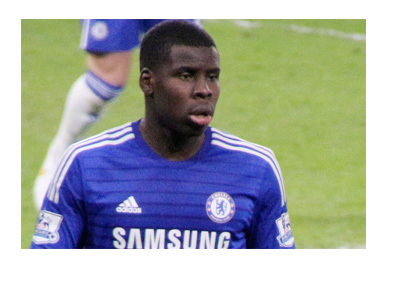 Zouma has featured for Chelsea in just 7 matches so far. That Jose Mourinho chose to include him in the starting eleven of Chelsea in a big-ticket event like the Capital One Cup final and fill in the shoes of someone as towering as Matic is validation of the coach's immense faith in the youngster's defensive abilities and potential. Mourinho said that he was preparing Zouma for that role and it paid off wonderfully well. Zouma who was named by The Observer as one of the most promising ten players in Europe in January 2014 now needs to be develop in the role of a center-half where he is naturally endowed to excel. With years of football ahead of him, one can expect him to be among the best defenders in the world in the not very distant future.